That moment when you realise that you're almost halfway through March and you haven't done any Easter baking yet... this is what that moment amounts to. Yes, I've been massively unoriginal with this bake, but hey, it's always good to throw your two cents into the mix! 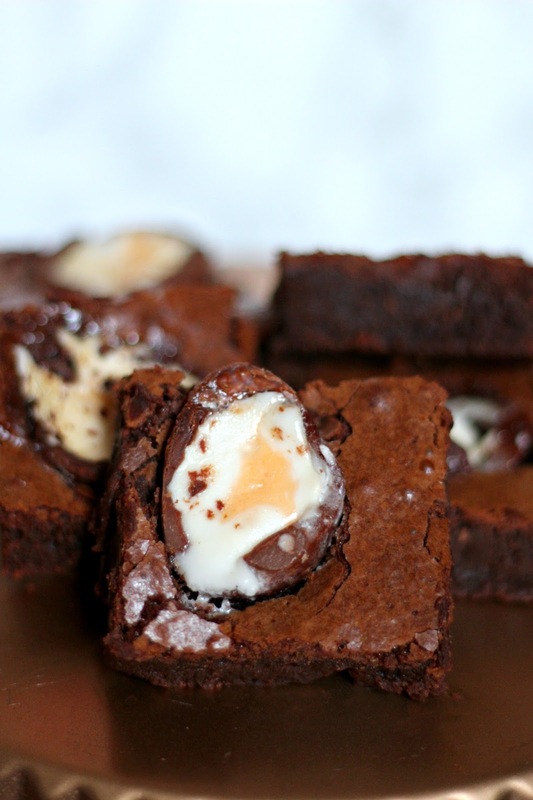 These scrumptious Easter treats are basically just my go to brownie recipe with Cadbury's Creme Eggs stuck on top. Hey presto, you've got something fun and delicious for Easter! Creme Eggs are pretty much a staple in the UK at this time of the year and I'll be honest, I wasn't a huge fan of them. That was until I tried baking with them - what a game changer! The reason I hadn't really liked them before was because I found the fondant stuff in the middle to be really sickly and it actually gave me a weird sort of sore throat, but once I mixed the fondant with a bite of brownie, my mind was changed. They both complement each other so well and result in a sort of sticky, sweet deliciousness. 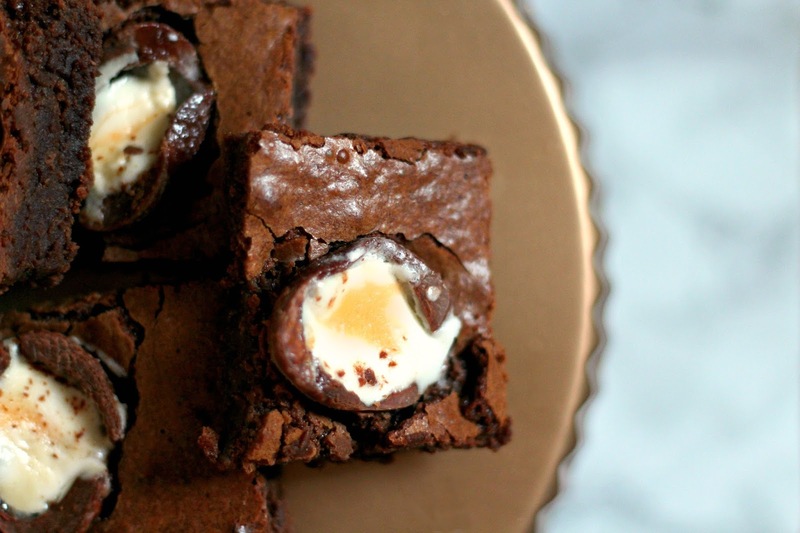 So for people that love Creme Eggs, you'll love these brownies, and for people that aren't so sure about Creme Eggs, definitely give these a go and see what you think! As I mentioned, this recipe uses my go to brownie recipe as it's base. I just find that this is a recipe that everyone can follow and it's something that's almost impossible to go with. Usually, I add in chocolate chips, but because each brownie has half an egg on top, I left the chips out, resulting in a plain chocolate brownie. This doesn't affect how gooey and gorgeous they are though. You're still left with a batch of fudgey goodness! Sift the flour and salt over the mixture, then gently fold together until there are no pockets of flour. Your mixture should still be fairly runny. Spoon the mixture into the prepared tin, spreading it out evenly, and then bake for about 20 minutes. Whilst it's in the oven, carefully cut your Creme Eggs in half. Once the brownies have been in for 20 minutes, pop the egg halves on top with the fondant facing upwards, then continue baking for 15-20 minutes. Leave the brownie to cool in the tin before turning them out. Once you've turned them out, trim off the crusty edges and cut into squares. And that's all there is to it! There's nothing complicated involved or any fancy techniques - just simple steps to making gooey, Easter treats! These would be ideal if you were hosting an Easter-themed bake sale or if you were doing a little party.